Hello Allison and fellow castaways, this is Mark Pouley with a review of an iOS app that I discovered last year and have been using ever since. The app is called Easy Pill for iOS by BirdsCorp.com. Until recently I didn’t regularly take medications so tracking when to take a pill was never an issue, but that changed last year when I was prescribed a number of medications and supplements. Being a geeky castaway I took this as an opportunity to find a technological solution, hopefully one that involved my iPhone and AppleWatch. 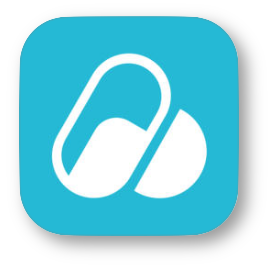 Easy Pill is an iOS app that tracks all of your medications and sends you reminders when it’s time to take a pill. This was exactly what I was looking for.The obvious first step to using Easy Pill is to input your medications into the app. While it works on an iPad or iPhone, for simplicity I’ll just be referring to the phone. You can create your list of medications either on the phone or the Easy Pill web page. I chose NOT to use the web page because I’m not comfortable uploading this information to the web. If I had, I would have created a list of all my medications, doses, and schedule, and the page would give me a QR code to scan with the app and all the information transfers to the app. I tested this method and it works well, but as I said, I didn’t want to upload all my meds to the web. Instead, I chose to input my information directly into the app on the phone. I wouldn’t call this process “intuitive”, but it didn’t take long for me to get the hang of it. Honestly, I think part of my issue is a good thing, because there are a lot of options available. How often do you take the pill? Do you take the pill the same time every day? What is the duration of time taking this pill? Easy Pill really offers a lot of flexibility to tailor the schedule exactly the way you need it for each medication. So it took me a while to get everything in the way I wanted, but I really appreciated that I was able to create a schedule that was accurate and useful. It’s also pretty easy to edit a schedule if you make a mistake or change something. Again, this process wasn’t exactly intuitive, but once I learned the process it was easy to accomplish and remember . There are two views for your medication. In one view, your pills are listed alphabetically with all the vital information. The more useful view, and the one I use most of the time, is the daily view. It shows a chronological list of all the pills to take that day. An icon next to each pill tells you the time to take the pill and the color of the icon gives a visual cue if a pill is overdue or to be taken in the future. The most useful feature of Easy Pill is that it reminds you to take your medication. This is accomplished with simple alerts that appear on the phone and and a tap on your wrist from the watch with a visual reminder. The app gives options for setting up the type and frequency of the reminders so the app can nag as much or as little as you like. When the pill is taken a single touch on the phone or watch logs the dose as taken. Easy Pill records the exact time the medication was taken and the icon for the pill changes to alert you that the status has changed. You can also skip a dose or pause a medication from the reminders. When you finish a course of medication Easy Pill will remember it for you, by automatically moving the medication to the archives. You can pull up the archives to look at the history of the medication, or move it back into your active schedule if you start taking the medication again. Another handy feature of Easy Pill, though I haven’t used it much, is a direct Google link for each medication that obviously connects to google for information and images about each pill. This is a nice way to remember what a pill looks like, learn about common side-effects and the like. 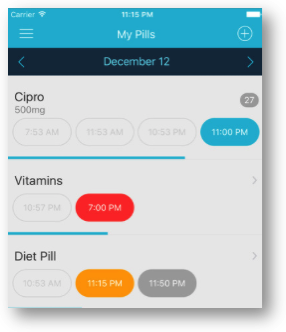 Easy Pill not only reminds you to take your medications, but it tracks your progress in a number of ways. Easy Pill reports how many doses and how consistently the medication was taken. If you input the quantity of pills you start with, Easy Pill will tell you how many you have left and when it’s time to refill the prescription. Easy Pill will also export a med list that includes pills that are currently taken or archived, detailed medication information and a dose log. This could be really useful to have a complete history of all the medications being taken. Having such easy access to a complete med list is really useful to share with doctors and nurses. If you’ve ever had to fill out a medication list in a waiting room you know how helpful this would be. Easy Pill includes the ability to sync the app between devices using iCloud. In theory, this could be useful to have your medication information on an iPhone and iPad. I say “in theory” because I didn’t have the best experience with it. I thought the extra screen real estate on the iPad would make entry of the medication information a lot easier. I learned the hard way that this function is very unreliable. I had a few medications already entered in the app on my phone and wanted to update and add a few more. I activated the sync function and entered the new information on my iPad. Easy Pill proceeded to delete the old information and move only some of the new information. I contacted the developer who suggested I needed to start over and, oh by the way, this function really isn’t working very well. I turned it off and haven’t turned it back on. I would normally condemn an application for this sort of thing, but I really don’t need the sync function and the application works well for the things I need. So while Easy Pill isn’t perfect, it meets my needs and I would recommend it. Easy Pill is $2.99 and works on the iPhone and iPad. Oh look, its time to take another pill… until next time. Good find, Mark! This will help a lot of people. I’m forever forgetting to take my vitamins. I’m going to tell a few friends that I know will appreciate the info. I’m glad you found it useful Denise.